Snow monkeys are quick learners! In the 1950s, Japanese macaques of the mountainous Shiga Heights region, also known as snow monkeys, took advantage of a beneficial environmental change: humans altered the temperature of some volcanic hot springs to make the water more comfortable for bathers. 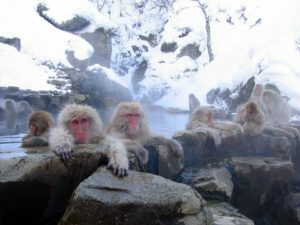 The snow monkeys, no dummies, took a cue from the human bathers and began to hot tub themselves! “Humans could survive with fur around their waist, but it is a lot nicer with a fire and a couch,” said Huffman. So, too, the snow monkeys adapted to the change, making the harsh winters a little more tolerable by sitting in the hot tub. If you’re as smart as a snow monkey, you’d be hot tub soaking, too. Pingback: How do you get rid of ants in your hot tub? Are these household ants or carpenter ants? Sounds like you may have carpenter ants which are attracted to moisture. Call an exterminator! !